If you ever need to be reminded why you work at Camosun College, consider attending the Annual Award Ceremony for students in the School of Access. Held on October 2 in the Young Building, many students ventured forth to be honoured for their achievements in front of their family, friends, and Camosun employees. Without exception, these students overcame significant personal, social, and scholarly challenges, to excel among their peers. It was a humbling experience to witness their modesty, which only made the fierce pride in their eyes seem all the more passionate. One of the awards, the Richard Rayfuse and Keith Todd Literacy Award, was presented by our Vice President, Keith Todd. 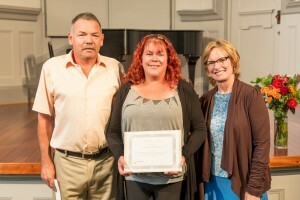 Several memorial awards were presented on behalf of past employees and other donors. Kudos to our member, Rhonda Maguire, for organizing yet another stellar ceremony for all to enjoy.